The small village of 'Whale Cove' is situated on part of north mountain along Digby Neck, overlooking the Bay of Fundy. The 'Cove' got its name because of the many whale sightings seen here over the years. The Harbour is used by some local fishermen to moor or land their boats during fishing season or to do repairs. 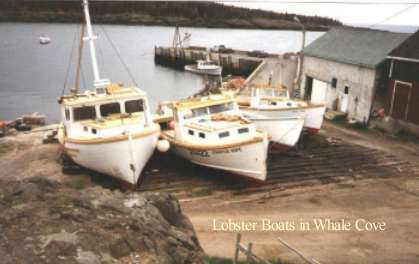 Boats fish for lobster in seasonas well as do other types of fishing. Other boats enter the harbour for various reasons. Last year a group of adventurous 'Kayakers' came across the Bay of Fundy from New Brunswick to camp with us. The Wharf is an attraction for tourists/visitors who love to have the experience of catching their own fish of the day. 'Mackeral' are often plentiful at certain times of the season. The Rock Beach is a pleasure to explore. Bay of Fundy tides bring various kinds of treasures onto the beach. Many collectors roam for seaglass, agate and other types of rocks. Whale Cove has 14 resident homes, with most of the folks having lived generations here for over 100 years. Folks are friendly and love meeting new people.You can see ducks, wild turkeys, chickens, and pets nearby. Sunsets in Whale Cove are spectacular. A stroll through the village is a refreshing and relaxing one for all who do so.